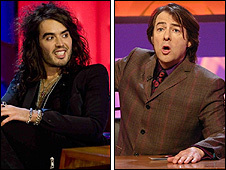 Jonathan Ross and Russell Brand are to be suspended and all their shows taken off air until the BBC has investigated their prank calls made on Radio 2. 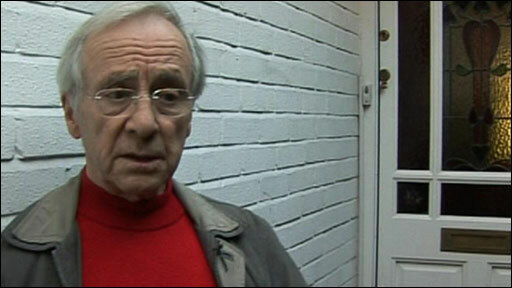 It follows a series of calls made by the pair to actor Andrew Sachs on Brand's Saturday night programme. The actor, 78, said he would not be reporting the matter to police. Meanwhile, Brand has told reporters: "It would be silly of me to speak without thinking because that's caused all this trouble in the first place." 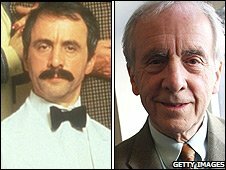 He added he was sorry he upset Sachs, famous for his part in Fawlty Towers, over comments made about the actor's granddaughter. Sachs, 78, said he was "not surprised" by the BBC's suspension of the pair but added: "I am not going to take it anywhere. I'm not out for revenge." 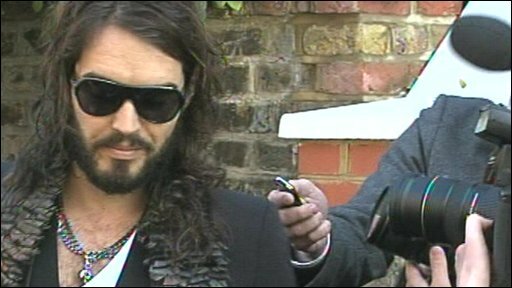 The calls were broadcast as part of Russell Brand's pre-recorded show on 18 October. During the calls, Ross swore and said Brand had slept with Sachs' granddaughter. More than 18,000 people have complained to the BBC while watchdog Ofcom has launched its own investigation. The corporation's governing body, the BBC Trust, has now called a special meeting of its editorial standards committee for Thursday. Director general Mark Thompson will report management findings to the meeting and tell bosses what action he plans to take. Announcing the suspensions in an earlier statement, Mr Thompson said he would be returning from a holiday and would "in the coming days, announce what action we will take". "Since Sunday, I have been in regular contact with the senior executives I tasked with handling this issue," he said. "In the meantime, I have decided that it is not appropriate for either Russell Brand or Jonathan Ross to continue broadcasting on the BBC until I have seen the full report of the actions of all concerned. "This gross lapse of taste by the performers and the production team has angered licence payers." He added his "own personal and unreserved apology to Andrew Sachs, his family and to licence fee payers for the completely unacceptable broadcast". BBC One show Friday Night with Jonathan Ross was due to have been filmed at BBC Television Centre, west London, later on Wednesday. Guests on the show were to have been Sir David Attenborough, comedian Frank Skinner, US teen singer Miley Cyrus and band The Killers. The BBC said people with tickets to be in the audience should not attend. A decision has yet to be taken on what should be shown in its place on Friday night. Ross's Saturday morning radio show, as well as Brand's Saturday night radio show, have also been pulled from Radio 2's schedules. Meanwhile, Ms Baillie, 23, told the Sun the pair should "pay for what they've done with their jobs". She said her grandfather was "really upset and says he wants the whole situation to end". "What's funny about humiliating a lovely old man who has never harmed anyone in his life?" she added. She said Brand and Ross were "beyond contempt". "It was bad enough that they recorded these things on my grandfather's answer machine but astonishing the BBC saw fit to broadcast it when they could have stopped it. "Someone high up at the BBC must have decided it was funny and suitable for national radio. They've shown an appalling lack of judgement." Prime Minister Gordon Brown criticised the pair for "inappropriate and unacceptable behaviour", while Conservative shadow culture secretary Jeremy Hunt said in a speech on Wednesday that it was "wrong for broadcasters to produce programmes that legitimise negative social behaviour". 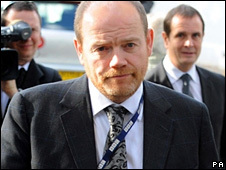 He told BBC News the corporation's reaction to the affair was "concerning". Labour MP Sir Gerald Kaufman, former chairman of the culture, media and sport select committee, said it was "essential for the BBC to ascertain quickly who was responsible for approving this pre-recorded episode". "This has not been handled well - clearly this should not have been broadcast in the first place and if Mr Thompson did not know about it then he needs to cut some heads off of the people that didn't let him know," he told BBC News. Sir Gerald added that if media regulator Ofcom were to fine the BBC for the incident, it should not be paid with licence payer's money. "If the BBC is fined I believe the two people involved should pay the fine and not the licence payers," he said.